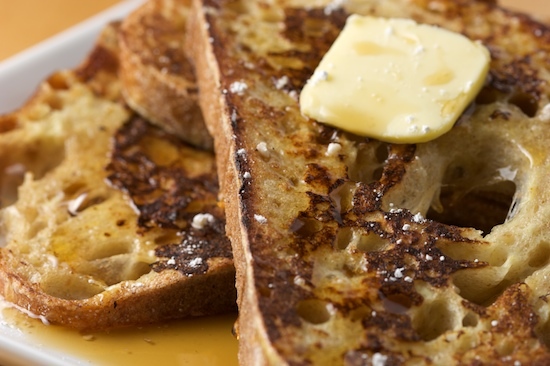 The best thing about French toast is that most households have all the necessary ingredients on hand at any given time: bread, eggs, and milk. Really, that’s all you need! Of course you can fancy things up by throwing in dashes of cinnamon and/or nutmeg. You can vary the richness by switching between skim milk, whole milk, or even half-and-half. And don’t even get me started on all the different types of bread you can use. The possibilities are endless. As a kid, we regularly ate whole wheat French toast for breakfast. On special occasions, it would be sourdough. But what I really loved was the diner-style French toast made with thick-sliced white bread. We never ate white bread at home, so when we would go out for breakfast, it was always so hard for me to decide between that white fluffy French toast and a short stack of blueberry pancakes. The French toast usually won out then and it still does to this day. Now that I’m an adult, I can choose whatever bread I want for my morning French toast, and sometimes I do buy that thick-sliced Texas Toast style sandwich bread just for French toast. 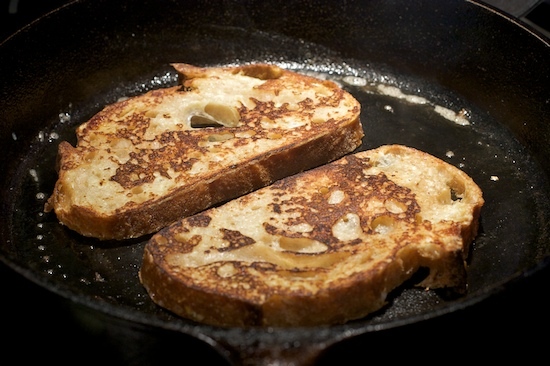 But right now my favorite French toast is made with stale sourdough bread. Sometimes I use homemade bread and sometimes, like today, it’s made with a crusty levain from a favorite local bakery. Whichever bread you choose, French toast is best made with bread that’s stale. Unfortunately, with all the preservatives they put in grocery store sandwich breads, most of those don’t really ever stale. But if you leave it out unwrapped overnight, that usually does the trick. Or you can just dry it out in a low oven for a few minutes. But in a pinch, you can use fresh store-bought bread and I think it works just fine. The formula is simple. 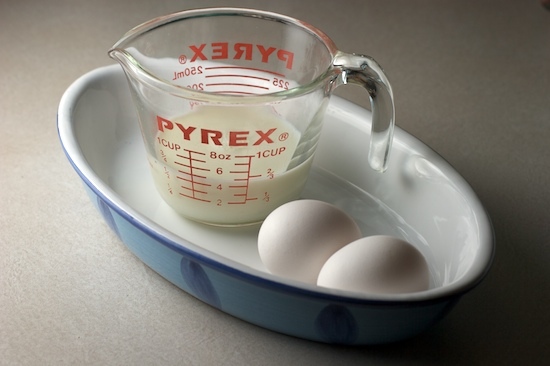 For each hungry person you plan on feeding, use one egg plus 1/4 cup milk. That will be enough for about three big slices of bread. 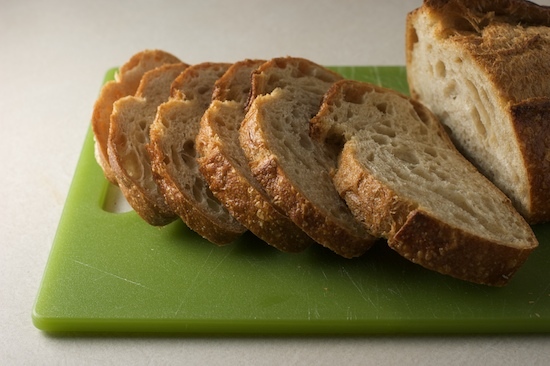 You will need a shallow bowl or dish that’s wide enough to fit one slice of bread and deep enough to hold your liquid. A square baking dish usually works quite well if you don’t have a bowl that will work. 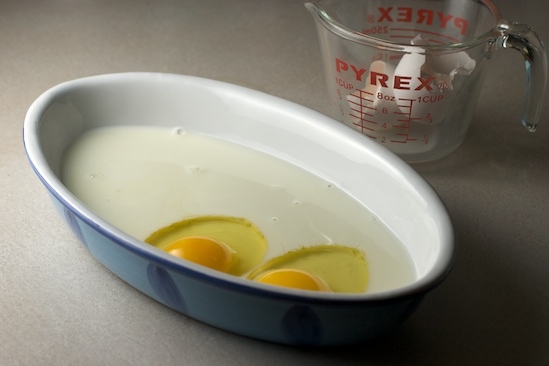 You can beat the eggs and milk right in the dish, using a fork. At least that’s what I usually do! Now you need to set up your french toast making station. Sliced bread on one side, egg mixture in the middle, and a hot pan or griddle on the other side. Start heating your pan over medium heat as you get everything organized. It’s also helpful to turn the oven on warm and keep a plate in there to keep the French toast warm if you don’t have people waiting to gobble it up immediately. 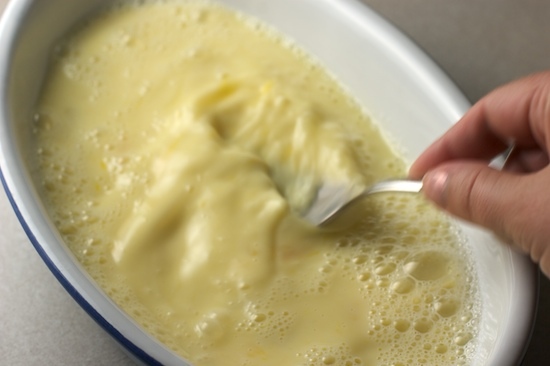 Now just soak a couple slices of bread in the egg mixture, making sure to flip them so each side of each slice gets wet. I don’t like my French toast soggy in the middle so I don’t let them soak too long, but it’s completely up to you how long you want to soak it. 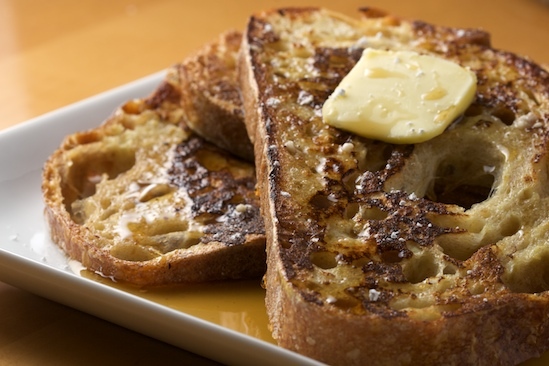 When the bread is ready to hit the skillet, drop a small pat of butter in the pan, swirl it around, and then add your slices of French toast. Flip the toast when it’s browned to your liking. See, wasn’t that easy? Perhaps I’m preaching to the choir here, but I think a big breakfast of French toast is one of the simplest, most satisfying breakfasts around. I love mine with lots of melted butter and powdered sugar, or sometimes maple syrup. And of course it doesn’t hurt to add a side of bacon or sausage. I hope you’ll enjoy this easy skillet French toast recipe! 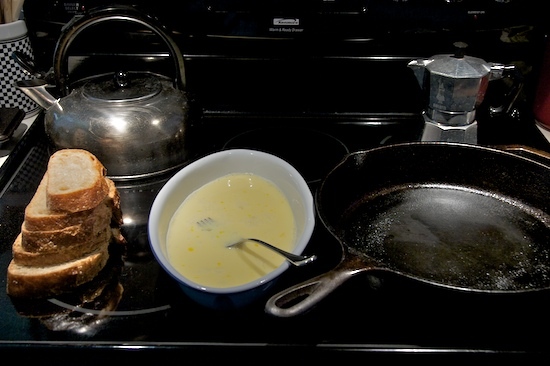 To make French toast for a crowd, add 1/4 cup of milk for each additional egg. 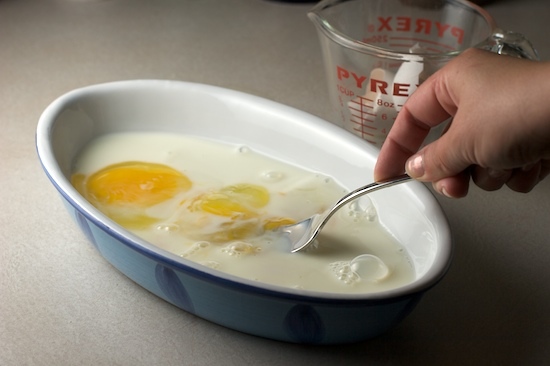 To serve one person, you can use just one egg and 1/4 cup of milk. *I sometimes add a splash of vanilla and a dash of cinnamon or nutmeg to the egg mixture, depending on which type of bread I'm using. If I use sourdough bread, I don't add anything extra. But the vanilla and cinnamon go really well with other types of white or wheat breads. Nicole, I think you should do NAPABLOMO or whatever it's called all year 'round. You get in a cooking groove and it shows immediately.I'm inviting myself over for brekkie...I'll even do dishes (Shock)! Good thinking Nicole! A great breakfast and a blog post in one fell swoop ;-) I've never tried making French Toast with levain, and that's what I always buy from B&C, so I wlil definitely have to give this a shot! Those look yummy. This is a family favorite so I reserve them for special occasions. My kids love it. I've never made French Toast and it's been at least 30 years since my mom made it for me for breakfast. So yes, a recipe to get me to make it at home works for me! This is one of my favorite things to eat for dinner too, which is what I'm going to do right now! Forget the vegetable soup sitting in the fridge. Now I have a serious craving for French toast. I also don't like my french toast soggy, so I give it a quick soak. And I agree, it's better with country style bread. Well...I pretty much agree with everything in this post! Bring on the french toast! I add a dash of vanilla to the egg/milk mixture and it goes over really well! I love french toast...yum! Yum! My favorite french toast is made with the day-old remains of a homemade loaf of cinnamon swirl bread...as long as there *are* any day-old remains! Good post. I also found via Google. When I was young I used to have French toast at cub scout camp - it was called "Eggy bread" there, and it was only when I was in my thirties that I found out that Eggy bread and French toast are the same thing! this recipe was perfect, and hit the spot! Hi! I really like your site. I tried making french toast with whole wheat bread - the kind with the nuts in it. It was very yummy! Here in Brazil we sometimes use coconut milk instead and it tastes amazing! I think this is a great website full of interesting things to make. I love french toast and making the perfect french toast has always been a challenge but using the steps in this website it was easy and fun! Hi Nicole, I am from Singapore and I was searching for french toast recipe because the last time I ate french toast was when my mom prepared it for my sandwich box to bring to school. :) Thanks for sharing this recipe! I like the point you made regarding the "sogginess" of the bread before frying it. On occasion, when I have had no "stale" bread, I would lightly toast the bread before soaking it in the egg mixture. Although, I have never tried the sourdough, but will try soon! Thanks! I love simple things like french toasts! They are delicious and you do not have to be a chief to prepare them. Also it is fast.